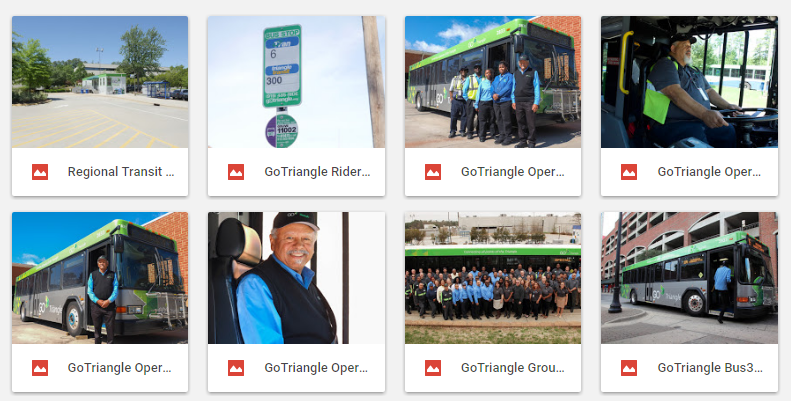 GoTriangle provides a vital service to the residents of the Triangle. As a result, representatives from the Communications and Public Affairs Office are always happy to try to provide information about GoTriangle and its operations to assist members of the media in writing their stories. To request information, interviews or images, please call the communications office at (919) 485-7413. We will make every attempt to provide the information, spokesperson or image within your deadline. Please feel free to use the images and logos included in this media packet when writing stories about GoTriangle. Looking for a specific image? Contact our videographer at swalz@gotriangle.org. Please note that those wanting to shoot videos, take photographs or interview customers on GoTriangle property need to make a request in advance through the communications office. Those on GoTriangle property to conduct an interview or to review requested information will be met by a staffer who will assist during the visit. For safety and security, visitors need to stay with the assigned representative while on our property. When taping, taking still photographs or conducting interviews on GoTriangle property, please don’t obstruct our passengers entering or leaving buses, shuttles, vanpools and transfer areas. If riders or bus operators decline interview or photo requests, please respect their wishes. GoTriangle follows North Carolina General Statutes when it comes to requests for documents. Please make all formal document requests to the communications office. If there is not a digital copy of a document available, GoTriangle may assess a charge of 8 cents per page. On the rare occasion a serious incident occurs, we share confirmed information with media as soon as practicable. Disclose, as soon as available, the type of GoTransit vehicle involved and the number of persons on the vehicle. Provide a general description of the incident and its effect on GoTriangle operations. At the site of a serious incident, law enforcement or medical personnel may restrict media access and movement. If the incident warrants, the GoTriangle communications office may designate a media staging area and provide a representative to assist media members, who will need identification for access. Media can reach the communications office at (919) 485-7413. For some incidents, a public service agency such as law enforcement, fire departments or EMS will file a formal report that media members can obtain. GoTriangle’s own internal investigation may take days or even weeks. Media members are welcome to observe, film or record the meetings of our Board of Trustees and their committees that are open to the public. We will gladly assist you with placing cameras and microphones as needed. Dates of public board meetings and their agenda are listed at gotriangle.org. For nonmedia issues, please call GoTriangle at (919) 485-RIDE (7433).